Kadai paneer, after Paneer butter masala i love this easy paneer dish as they go for simple preparation.If you need a quick side dish for your rotis if you have sudden guest or hungry tummies, then you should give a try to Kadai paneer. 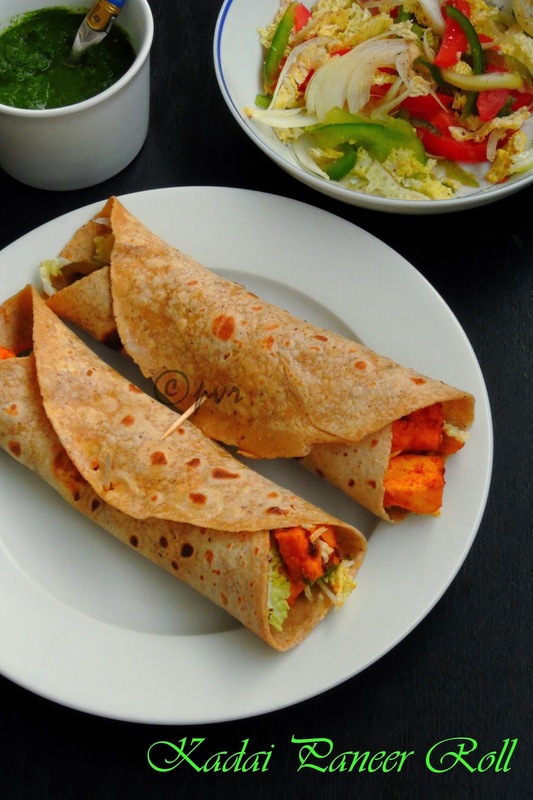 Kadai paneer makes an excellent filling if you are planning to make a super filling roll. This delicious paneer dish goes for succelent paneer cubes and crunchy diced onions with capsicums. Some make kadai paneer as dry version while others make this beautiful dish as semi gravy.If you have paneer lovers at home, am sure this alluring Kadai paneer roll will definitely satisfy their tastebuds. As much as like other chappathi rolls, this Kadai paneer roll with definitely satisfy anyone at anytime. If you are a vegan just replace the paneer cubes with tofu cubes to enjoy this super delicious roll. To make this roll more interesting, delicious and healthy i used both coriander chutney and ketchup. My kids just enjoyed thoroughly this super catchy kadai paneer roll and we had a super filling sunday brunch with this tasty roll.If you dont want to have a heavy sunday brunch, am sure that this calcium rich kathi rolls is quite enough to satify you, just give a try.Check out the Blogging Marathon page for the other Blogging Marathoners doing BM#48. Blend all the ingredients together as a smooth chutney, arrange in fridge and use per need. Take a chappathi, spread the green chutney as per need. Top it with the chopped vegetables, now drop enough kadai paneer. Drizzle the ketchup as per need. Roll it tightly and enjoy. Broyer tous les ingrédients ensemble jusqu'a ce qu'une pate lisse se forme, disposer dans un réfrigérateur et utiliser. Tartiner le chappathi avec le chutney . Ajoutez à cela des légumes hachés , ensuite déposer les cubes de paneer . I made something similar. I like the way you have presented it. Looks so yum! These are very popular in our house. .they look do well presented and delicious. Kids favorite at my place . Very well presented. looks so awesome... my daughter would love this!! Looks so delicious Priya..very very inviting! Priya these rolls are so yummy. I am hungry again. Yummy Kathi rolls,so satisfying and filling. Kadai paneer Rolls looks so yum!!! beautiful presentation.. 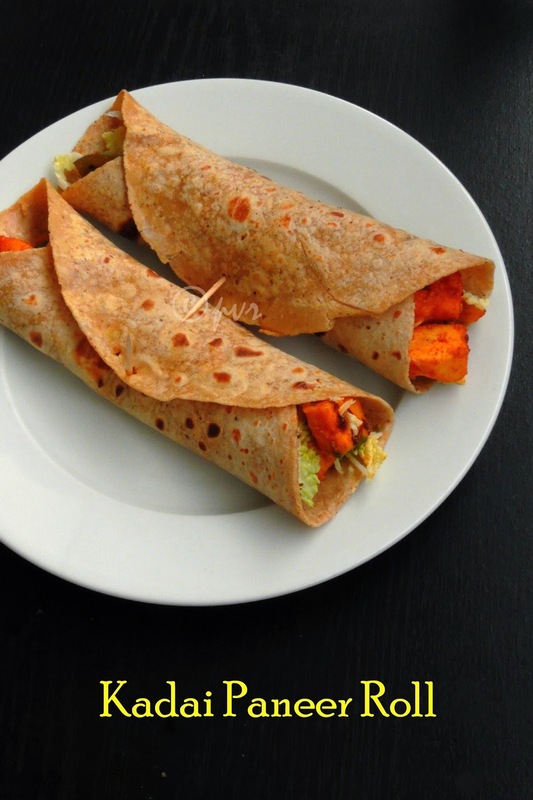 Colorful and healthy wraps, Priya! 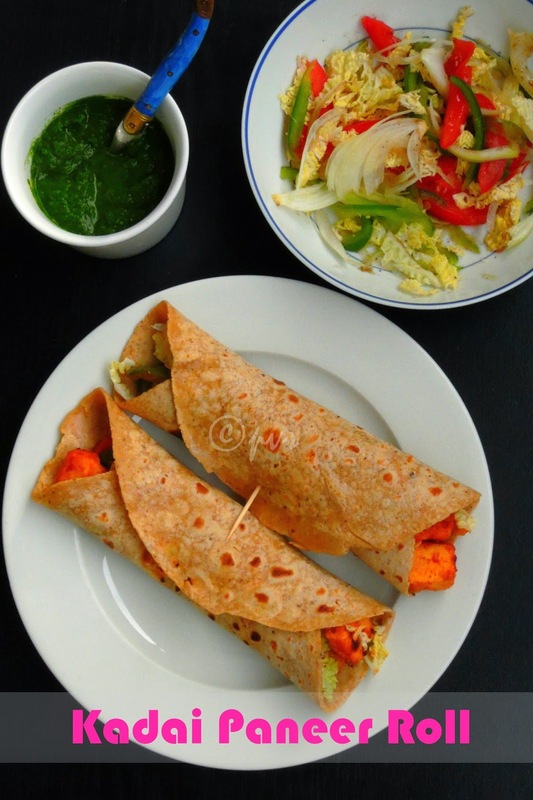 What a colorful and delicious looking paneer wraps. Love your presentation. How are you doing? Its so strange that I made a similaar kathi roll last week...not kadai paneer but hte regular one. I tried Achari Paneer last month, just never get to have enough to click pics!